My name is Shmuel Gurewicz. I was born in Soviet Russia. We escaped the Communist regime in 1946 together with several hundred Lubavitcher Chassidim . From 1947 to 1949 we lived in Paris and at the age of thirteen, my parents, together with another five families we were sent by the previous Lubavitcher Rebbe, Rabbi Yosef Yitzchak Shneerson to Australia. We established educational institutions here in Melbourne. A Yeshivah , a Jewish Day school for boys, and for girls. Kindergartens, girls seminary and a Kolel. In 1960 I married an Israeli girl and in 1964, we made Aliya and settled in Israel. 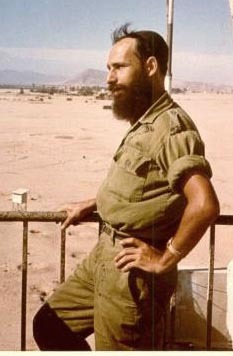 I was conscripted to the Israeli army in 1965 for national training. After that, I was assigned to the reserve troops. In May 1967, when Colonel Nasser, the Egyptian President massed troops in Sinai on the Israeli border and closed the Straits of Tiran to Israeli shipping, Israel regarded this as a declaration of war. While the diplomats were running around between Washington, London, Paris and Tel Aviv, the Israeli public was preparing for war and expected the worst. The Arab leaders were inciting their populations with dramatic promises that they will “push the Jews into the sea”. In Israel the army started a general mobilization. First the pilots were called up and the armoured corps. Then more and more reserves were called up. More and more homes were left without their fathers/husbands. People were really frightened and very concerned for the future. Israel was outnumbered one hundred to one. The Egyptians had German scientists developing missiles and the Russians supplying them with tanks, combat jet planes. The French who supplied Israel with the Mirage fighter planes, declared an embargo on the supplies to Israel with the excuse of not supplying arms to a combat zone. The Chevra Kadisha (burial society) of Tel Aviv alone dug fifteen thousand graves to be ready for civilian casualties. I was called up on the 25th May to report for duty on the 26th. In a way I was relieved because it was not very pleasant to be the only male in a 3 story block of apartments. 26 May was Friday and my regiment organised themselves until Sunday. On the Sunday we were moved to a hill, 150 meters from a Jordanian village called Budrus. On the following Friday, our officer Victor came and announced that 10% of the soldiers can go home for Shabbat , 24 hour leave. We were 130 soldiers and the first to go on that leave were meant to be fathers of three children and above. And I fell into this category. Unfortunately, the truck which came to take us back to civilization came at 7.00pm, twenty five minutes before candle lighting time for Shabbat. So I could not go as I would have to break Shabbat by travelling. The following day, Saturday, again another thirteen soldiers could go home and I was hoping that this time I would be able to go. But again the truck came at 7.00pm when it was still Shabbat. Once again I missed out. Victor, my commanding officer, who was not a religious man, took pity on me and said that since I missed out on my leave because of my religious principles, he would let me go on Sunday night for 48 hours. To me this was like an eternity! I was waiting for the day to pass impatiently. On Sunday afternoon we heard on the radio that Iraq sent two armoured divisions into Jordan to bolster their army for the forthcoming war with Israel. A little later, Victor came to announce that all leave is cancelled. Since we were in the centre line having to defend Israel from Jordan, therefore the readiness level had to be put up onto the highest level. I was terribly disappointed, not so much because of the prospect of the war but because my leave of 48 hours is now cancelled! I tossed and turned a whole night. On Monday (5th June) morning at 5.00am, I went to Victor's tent and begged him to let me go and see my family even if for a short period of time. Victor then told me that he will let me go but only for eight hours. I must be back by 3.00pm. It must be pointed out that no one knew that the war is to begin in about two hours. Even Victor who was our commanding officer did not know. I did not wait to argue about the eight hours. I took my rifle, my Talit and Tefilin in my backpack and ran! One can imagine the reunion with my wife and children! After a while the radio reported that heavy fighting has broken out in the south. So the long-expected war has began. In Jerusalem, people felt safe. No one believed that Jordan would start any hostilities. Jerusalem was then a divided city. The distance from East Jerusalem under Jordanian control was the same as from West Jerusalem under Israeli control. But at about 11.00, the Jordanians started shelling West Jerusalem. We all went down to the air raid shelter. I ended up again the only soldier with a whole shelter full of women and children. A little later I called up the Ketzin Hayir to report that I am in Jerusalem and what shall I do. I was told that I must return to my unit and in fact I should have not been away in the first place. So I had to say good bye to my family and in the middle of the Jordanian shelling made my way to the main road where I waited together with many more soldiers for a ride. Finally I got a ride with a police car which dropped me off in Ramle. From there I had to walk about 2 hours to join my unit on that hill near Budrus. All the way, shells were exploding in the distance and also near by. If I would have taken leave on the previous Friday night, I would not have been away on that Monday! And I would have not been here telling this story. Kollel: an institute for advanced studies of the Talmud and of rabbinic literature for Jewish adults, akin to a university. Shabbat: Jewish sabbath, a day of rest, prayer and celebration, when it is not permitted to work or ride.